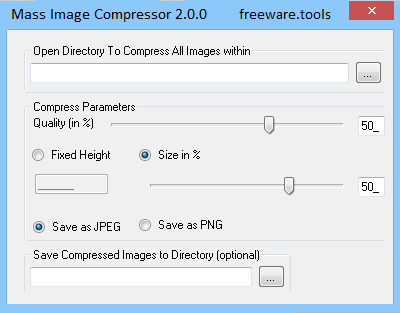 Mass Image Compressor is a Windows utility designed to reduce the size of image files occupying the disk by applying quick optimization methods. It comes packed with just a few intuitive options that can be easily figured out by users. MassImageCompressor reduces considerable (>90%) image size by compromising on Image dimensions and Quality. Reduce all images in a folder (and optionally sub-folders) with just single click. Mass Image Compression for webpages, email or storage on mobile device was never this easy. Simply stated, this tool allows you to compress images in order to reduce their file size, and convert them to PNG or PNG. In addition to compressing your files, the application is also capable of converting them to JPEG or PNG. The setup procedure is brief and uneventful, since no special attention is required here. As for the interface, Mass Image Compressor adopts a single and classical window that does not contain visually striking elements. One aspect that should be noted is that .NET Framework needs to be installed on your machine for the application to function correctly, but, on the whole, the setup procedure is relatively straightforward. Batch processing is supported, meaning that you can work with entire folders of images to reduce the overall task duration. A directory can be pointed out with the help of the tree view. It is possible to adjust the compression quality, set a fixed height and tweak it, as well as to save the new pictures as JPEG or PNG files to a user-defined directory. In addition, you can examine the modifications before applying them, as well as zoom in and out of the pictures. There are no other notable features provided by this software utility. Mass Image Compressor has minimal impact on system performance, since it runs on a low quantity of CPU and memory. The Tool does not hang, crash or pop up error messages. Although it is not particularly resourceful in its feature set, Mass Image Compressor offers convenient solutions to compressing image files to make them smaller, and can be used by anyone.